Im guessing that I would need 2 TL074s to buffer the ins and outs. 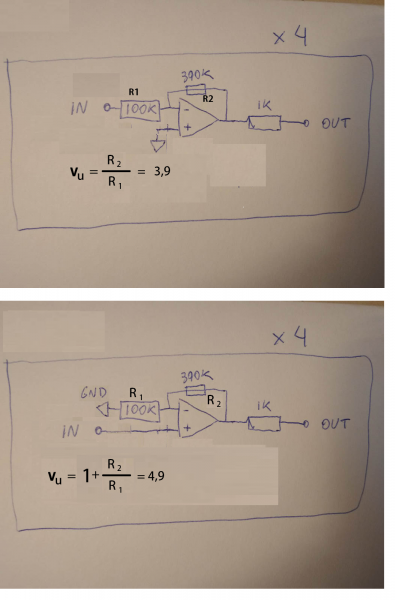 100k impedances in the ins, 1K in the outs and trimming the opamps for +-10v ranges in the outs and +-1V in the ins. I´d be using only the +ins of the opams, the inverters should go to ground. 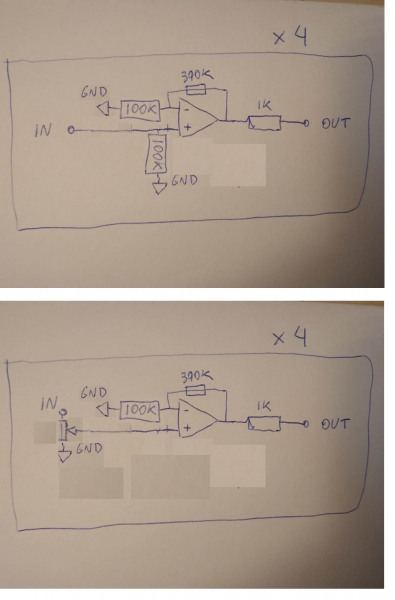 Could I use just voltage dividers for the ins and just buffer the outs?. If you have tips or suggestions about building something like this it would be very appreciated. Im quite a newbie and I dont want to magicsmoke the soundcard. There's a good chance that the soundcard may be AC coupled, and get grumpy about DC control voltages. I didn´t thought in th DC coupling at all. The diamond soundcard experiemtn is exactly the same idea. You have saved me a ton of time again. So I have built this. 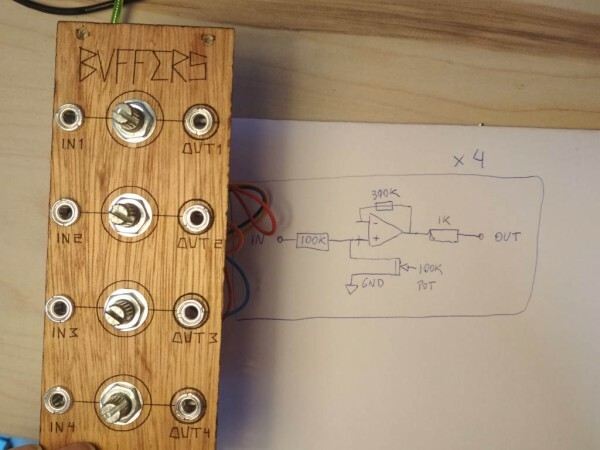 The idea is to buffer the audio inputs and amplify it to eurorack levels. 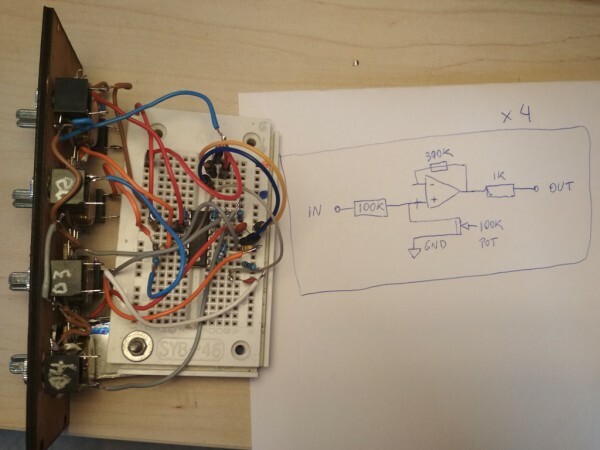 When I breadboarded it I would swear it was working, but now Im getting half of the amplitude of the signal instead of multiplying x4 as it should. 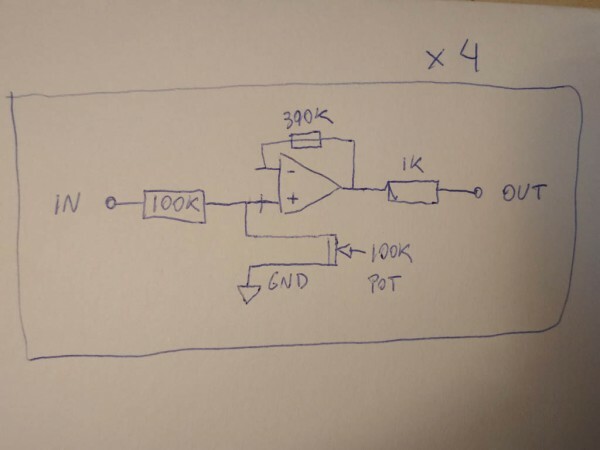 with the resistor combination of 100k/390k the opamp will amplify the signal by 4,9.
if you need the factor 4 you should use 100k/300k or 33k/100k. Yeah, that´s it. If someday you come to Spain I´ll invite you to some gallons of beer. thx, would be a pleasure!